Binnington's play has been so impressive, it's not only inspired his teammates, but maybe even a name change. Though he'd appeared in three games previously for the Blues, Binnington's first NHL start came on the road in Philadelphia at Wells Fargo Center Monday. He turned aside 25 shots on net to hand the Philadelphia Flyers their seventh straight loss while earning the game's second star. Binnington was tested early with 11 shots in the opening frame, highlighted by a fantastic save on a redirection by Oskar Lindblom in the final minute of the first period. "I think I was a little bit nervous, but at the same time calm and just tried to focus on my job and just stop the puck," Binnington told reporters about his game day nerves. "Go save by save, minute by minute and just enjoy the experience, and before I knew it, the game was over." 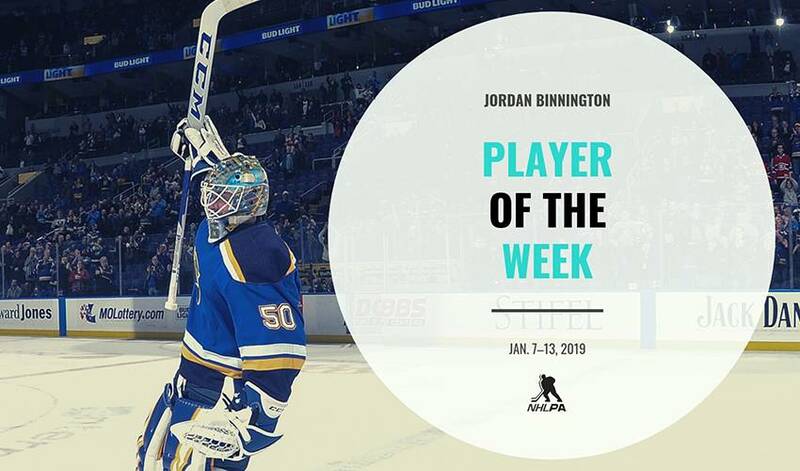 Ahead of the night's shutout, Binnington was named the CCM/AHL Player of the Week for his play with the San Antoinio Rampage, and still leads the league's active netminders with a 2.08 goals-against average and a .927 save-percentage. "It feels good, for sure," Binnington continued. "I was definitely excited to finally get the call. It was a long road, and I'm happy where I'm at right now and I'm hoping to get some more action and be part of the solution on the rise with the Blues." With Wednesday off as the Blues returned home to play the second half of a back-to-back against the Dallas Stars with Jake Allen in net for a 3-1 loss, Binnington was back at it for his first start at Enterprise Center Thurdsay night. No. 52 made 28 saves for his second straight win in a 4-1 victory against the visiting Montreal Canadiens to earn the game's first star. "I'm happy with that one," Binnington told reporters postgame. "It's my first start at home. I'm pretty excited about that. It was an exciting game, entertaining. We're happy with that outcome." "He's done great. The first couple games when he got thrown in, it's a tough situation, but the starts, he's been lights out. That's awesome," Blues teammate Jay Bouwmeester spoke of Binngton's play. With 21 saves by the 25-year-old netminder, St. Louis earned redemption in a do-over against the Stars – following a loss by the reverse score Tuesday – on the road at American Airlines Center in a 3-1 win over Dallas Saturday night. "It's been truly amazing, honestly," Maroon said postgame in awe of Binnington's composure. "I just think he comes up and he has an opportunity to play and another [heck] of a job for the guys." With Binnington's third straight win in hand, he found his name atop league standings for the week by leading goalies who had more than one start with a .974 SV% and 0.67 GAA. The Blues continue along their road trip with a tough test Monday in the defending Stanley Cup Champion Washington Capitals (7 p.m. ET).